To us, corporate identity is the ‘PERSONA’ of a corporation and the logo as well as brand is responsible for expressing the corporation’s business objectives as well as helping them attain the same. 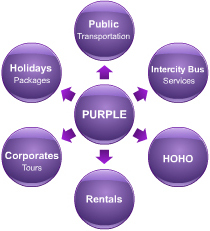 Purple is the range of shades of colour occurring between red and blue, thereby effectively representing the variety of services and operations covered here at Prasanna Purple, right from city buses to packaged holidays. Purple is the colour of royalty, which is what we hope our customers feel like when they travel or holiday with us. Open to the modern thought. The Purple symbol ('P' mnemonic) is a prominent visual element of the Purple Signature Communication. The Purple symbol, communicates to our stakeholders, our traditional values and modern outlook. It represents what we at Purple stand for, that is quality service and putting 'P'eople first, whether they’re our customers, or, our employees. The font used for the Purple Logotype was specially created. It amplifies the bold and steadfast manner in which we approach our projects and endeavours. However, curved edges in each letter, from a design perspective, align it with the Purple Symbol, also highlights the softer side of our company. The side that knows its responsibilities to its people, be it our employees or customers, our environment and economy. The word and the colour Purple were chosen as the Brand Name and the Brand Colours, as it is one of those rare colours that does not carry any negative emotions with it. Purple general term used for the range of shades of colour occurring between red and blue, thereby effectively signifying the entire gamut of operations we cover here at Prasanna Purple, right from city buses to packaged holidays. Also, when most think Purple, the images of royalty make an appearance, the emotion of being a Cut Above the rest comes to the fore, which is exactly the experience we would like our customers to have, whether they use our city buses, or, choose to holiday with us. Preferred colour version: Wherever possible the Purple Corporate Signature should be reproduced in the Purple Shades of the Purple Signature and the grey of the marketing strapline, on a white/light background. The background should ensure optimum clarity of all elements of the Purple Corporate Signature. Alternative colour versions: In circumstances where the background is the same shade of the Purple logotype/a dark colour, the use of the Purple Signature with a white outline and the strapline in white is permitted. NOTE: This format of the Purple Corporate Signature is to be compulsorily used for all our branch back lit signages. Monochrome versions: In circumstances where the background is the same shade of the Purple logotype, the Purple Corporate Signature in complete white can also be used. However, on non corporate colour backgrounds, especially dark backgrounds, this format of the Purple Corporate Signature is to be used. Greyscale version: The greyscale logo in which the Purple Symbol and the strapline are in a shades of grey and the Purple Logotype is in black, is to be used in greyscale printing processes.